Trains may run normally with with snow lying up to 20cm above rail level. When snow is 20-30cm deep, trains fitted with miniature snow ploughs can run normally, and these may also be authorised to run when the snow is up to 45cm above rail level. Many former BR diesel locomotives can be fitted with 3 piece miniature snow ploughs (MSPs). However Class 66 and Class 67 locomotive are not equipped for this. 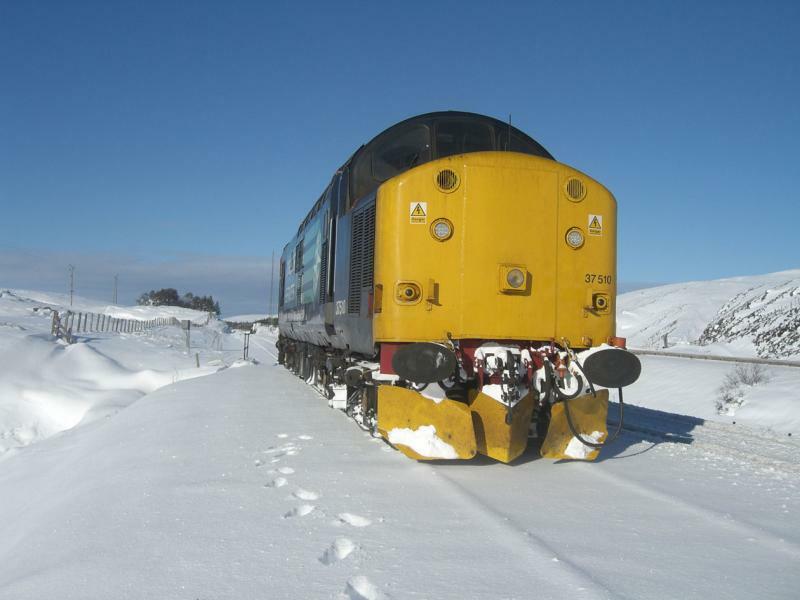 Locomotives fitted with miniature snowploughs may be hired by Network Rail for patrol work, running light engine during falling snow to keep the line clear. Class 156 units were fitted with snowplough/obstacle deflectors when they were introduced to Scotland in 1989. Class 158 units based in Scotland (158701-746) had the lower front end fairings modified to include a snowplough blade during 1991. These are officially classed as obstacle deflectors rather than snow ploughs. 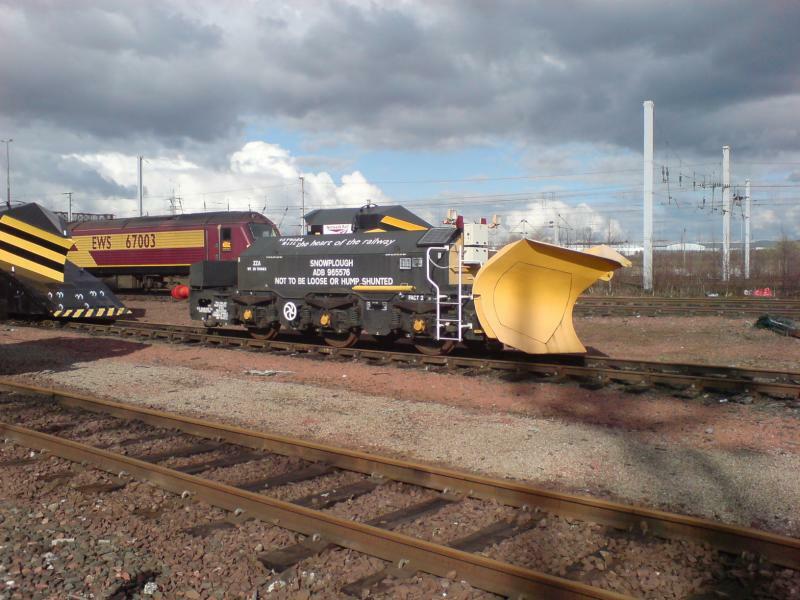 Network Rail own specialist equipment which can be used to clear drifting snow which is beyond the capability of the miniature ploughs fitted to locos. The vehicles listed below are those likely to see use in Scotland. These large 'Drift' ploughs were built by British Rail in the 1960's on modified frames of steam loco tenders. 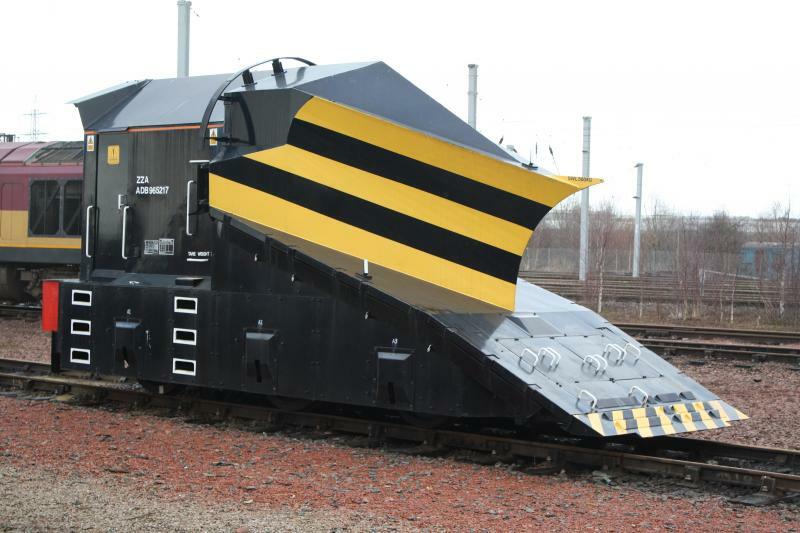 Network Rail has 20 of these ploughs. The ploughs are equiped with retractable side flaps, skids, and adjustable front spade plates. These must be retracted except when required for ploughing. The normal formation of a snow plough train should be 2 independent ploughs separated by 2 main line diesel locomotives. Where 2 locomotives are used these should be working in mutiple. The snow plough train must be accompanied by a track engineer's representative, a traction supervisor, and a rolling stock technician. The driver is permitted to drive from the leading cab of the second locomotive. No train may run on any adjacent line to that being cleared. Network Rail has 8 of these ploughs, which were constructed in the 1980s. They are Beilhack Type PB600 ploughs mounted on former class 40 bogies, and are used for patrol work and ploughing drifts up to 1.8 metres high. The ploughs may be coupled front and rear of a locomotive, or worked singly provided the loco is equiped with miniature snow ploughs. Maximum speed is 45mph. The train must be accompanied by a Network Rail operations department representative and a rolling stock technician. When in use on double track lines the plough blades are adjusted to deflect snow to the left of the track. Normal working can continue on adjacent lines unless the person in charge considers there is a danger to other traffic. Network Rail's fleet of Beilhack ploughs were overhauled at Brodie Rail, Kilmarnock in 2011. Following this, two originally based at Mossend were reallocated to Doncaster. These are Beilhack self-propelled rotary snow blowers which can operate at up to 40mph when not clearing snow. The first machine was built in 1980 and based at Inverness. A second was built in 1989 for Network SouthEast and based in London. It moved to Kilmarnock in 2002. Both snow blowers moved to Motherwell in 2007, and then to Rutherglen OTP Depot in 2008. Snow blowing may only take place when traffic on adjacent lines has been stopped. The snow blower machines feature a built-in turntable allowing them to change the direction of snow clearance. 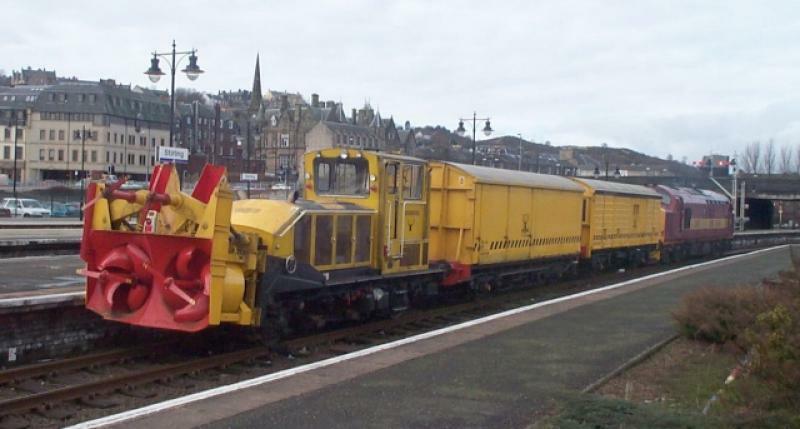 An experimental snow blower mounted on a redundant 'Grampus' open wagon (number DX69001) had been parked out of use in Perth New Yard for many years, but was scrapped in 2008. Scotland has its own £1m winter-weather engineering train that quickly defrosts rail junctions. The train has hot-air blowers at either end and uses blasts of steam, hot water and compressed air to quickly thaw frozen points. It is also used to transport equipment and people quickly to wherever they’re needed on the network. The two-vehicle train first appeared for testing in February 2012. The train is normally based at Perth carriage shed. Created by Dysgraphyk and last modified by him at 01:07, 08 of December 2017.